The Diabolica are graphic works of portable format that literally “set the stage”. 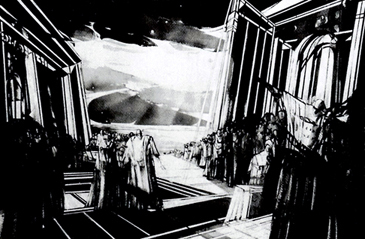 On first glance these dashing wash-drawings could be taken for stage designs. Temple-like buildings, agora-like squares, monumental daises and colonnades provide exquisite tectonic settings for their scenarios. Again, the juxtapositions and configurations happen on diagonal tangents that heighten the dramatic tension. The protagonists are divided into distinct groups, as the aggressors and as the aggrieved, the oppressors and the oppressed. There is no overt conflict, no trace of violence, just the constant presence of approbrium. The postures alone express the totality of these pernicious relationships. These works are a tour de force of aesthetic reality impregnated with meaning. The expressive devices are limited an d fully integrated into the pictorial logic, yet their communication is immediate and unequivocal. For example: The oppressors, who are fewer in number that the oppressed, populate the picture planes closest to the observer, or they congregate on some elevated plateau. The logic of perspective thus demands that they become larger in size, and thus dominant. The artist ascribes to them specific postures: a sinister countenance, a twist of the shoulder, a draping of a cloak, a lifting of the chin, an ominous pointing in a certain direction by the show of a grim profile. These gestures suffice to characterize their role. One does not have to transpose any of these personages to understand his sinister design. The body language of the menaced grouped is no less eloquent: the figures huddled together, the heads are inclined or drawn close to the shoulders, arms hang limp along the body, or may be lifted to hide a face. Fear has frozen these human shadows into passive anticipation of their doom.